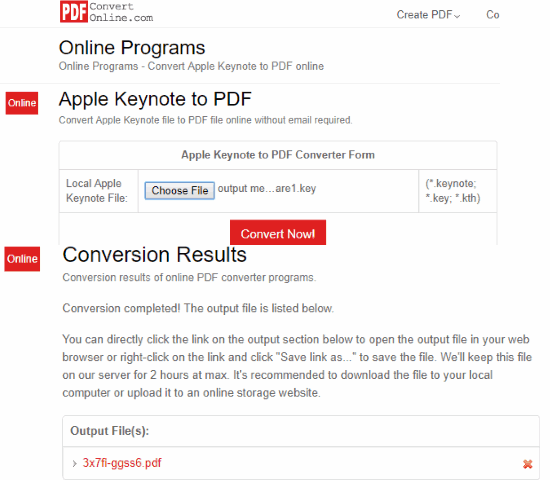 Here are 5 free Keynote to PDF converter websites. Keynote file (*.key extension) is a presentation file, just like PowerPoint presentation file, which is created using Keynote software of Apple. If you receive or have some Keynote file and want to convert it to PDF, then these are some best websites you should try. All these websites support feature to upload KEY file from PC and convert it to PDF. Some of these sites come with feature to upload KEY file from Dropbox and Google Drive. A few unique options can also be found. For example, you can create a single PDF for input Keynote files, save output to Box, OneDrive, Google Drive, Dropbox, convert multiple Keynote files at a time, etc. Let’s check these free online Keynote to PDF converters. CloudConvert (Homepage) always comes under my best picked file conversion websites. 200+ formats are supported by this website and Keynote to PDF conversion is also possible. The free plan (with sign up) is limited but handy for normal use. In the free plan, 5 Keynote files can be converted at a time. The good thing is maximum 1 GB size file can be uploaded which is just awesome. You only get 25 minutes for conversion in a day but that is sufficient I guess. File uploading feature is also good because you can upload Keynote files from 6 different platforms. These are: PC, Keynote file URL, Box, Dropbox, OneDrive, and Google Drive. Another great feature is you can select whether you want to generate a single PDF that will contain all the pages of all Keynote files or separate PDF files for each Keynote file. When file conversion is finished, you can save output to PC or any of these supported cloud storage services. You can also remove the output files using the delete button when you’ve downloaded them. Or else, the website will do this itself for input and output files after every 24 hours. PDFConvertOnline comes with a separate “Apple Keynote to PDF” feature. Here is the link for that feature. It can convert one Keynote file to PDF at once but the good thing is input file size limit is 128 MB, which is more than sufficient for Keynote format. Use Convert Now! button after adding Keynote file. The upload and conversion process is started and completed automatically. When the output is ready, it can be saved to PC with a single click. The PDF and Keynote files are also deleted from the website after one day. You can also delete output file immediately if you don’t want to wait for 24 hours. Zamzar doesn’t need any type of introduction. It’s an old and very popular file converter website. The good thing is KEY to PDF conversion can also be done pretty easily. Here is the link to this conversion feature. In the free and basic version, it lets you add 5 Keynote files at once and then you can provide the email address to get the PDF file. You can’t get output files directly. Therefore, email address is needed. You also need to take care that in its free plan, maximum 50 MB files can be uploaded at once. Though the size limit is low, it is OK for Keynote format files. Apart from KEY to PDF, it lets you convert KEY to PPT, PPTX, HTML, and other format files. Your files remain on the server for 24 hours and finally the website deletes them. 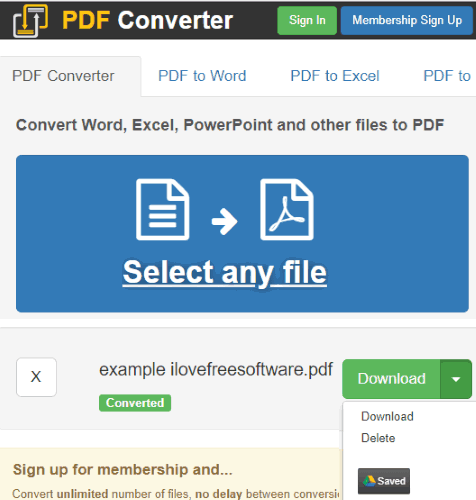 Online-convert.com (Homepage) is also a very useful website to convert KEY to PDF. The website has some interesting features that you can try. 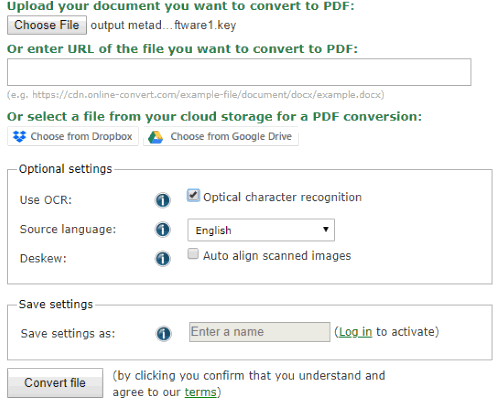 You can upload KEY file from PC, Google Drive, or Dropbox. An online KEY file can also be converted to PDF. Only one KEY file can be converted at once and the file size is limited to 100 MB. Before converting KEY file to PDF file, you can also enable deskew option to automatically straighten images for output PDF. Finally, when conversion is done, you can get the output and download it to PC. This websites deletes your files after 10 downloads or 24 hours. Freepdfconvert.com (Homepage) is also a nice option to convert Keynote to PDF. Only one Keynote file can be converted at a time but the website is good for the purpose. Its free plan has limitations but nothing is mentioned on the website. I was able to find out that you need to wait for some minutes (more than 30 minutes) after converting couple of Keynote files. This might be the reason you don’t like this website. If you have to convert only a few Keynote files, then it is surely helpful. This online Keynote to PDF converter is very easy to use. Upload a Keynote document and it is automatically converted to PDF file. After that, you can download it to PC and/or your Google Drive account. The input and output files are also deleted automatically but time period is not specified. 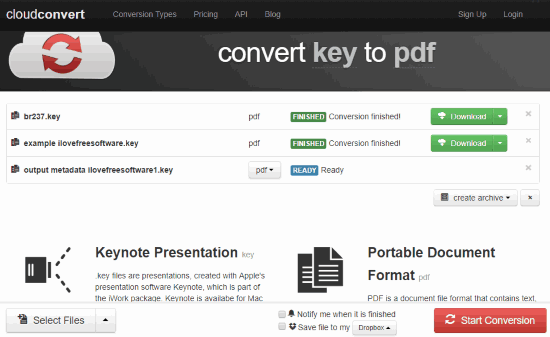 We have also covered a free PDF to Keynote converter website for you. This is all about some best free and online Keynote to PDF converters. All are good to convert one Keynote file at a time. But, if you want to convert multiple files together, upload KEY file from Dropbox, Box, OneDrive, etc., then “CloudConvert” is the best choice. I also prefer this website over other Keynote to PDF converter websites.